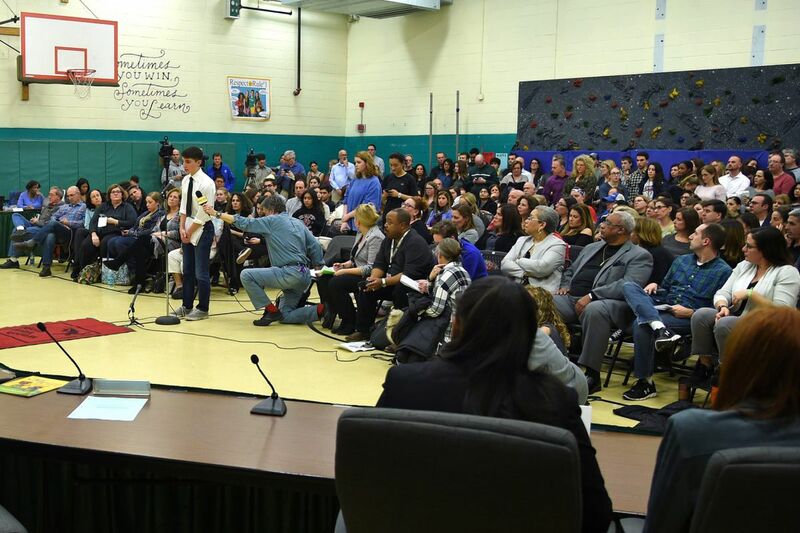 The Cherry Hill School Board meets February 27, 2018 after two days of protests by hundreds of Cherry Hill High School East students sparked by the suspension of popular history teacher Tim Locke who made comments against security issues at the school following the Parkland, Florida school shooting. One night at a Grateful Dead show, the jam band's bearded leader, Jerry Garcia, locked eyes with a follower in the crowd and inspired that man to become a teacher. At least, that's the story Cherry Hill East AP history teacher Tim Locke told his students one day. "He's a major Deadhead," said Gabriel Ritter, a senior at the high school. "He said he's seen them over 100 times. He has a ton of old tickets." Locke, 59, is a storyteller, his students say, a teacher who weaves currents events like the massacre in Parkland, Fla., into his class almost daily. On the morning of Feb. 22, Locke said, he was expressing concerns about security at Cherry Hill East and after a student became upset, he was placed on administrative leave and ordered to undergo a physical and psychological evaluation. "My fourth day of teaching was 9/11," he told the Inquirer and Daily News the day after the suspension. "I've been waiting for them to secure these buildings. They still haven't addressed it. I talked to the kids, with impassioned pleas. Kids respond to me." Most students, like the hundreds who protested his suspension over comments he made about school safety concerns, love his style. "In all the years, I've gone to school, he was probably my most favorite teacher," said Alexandra Gitter, a former student. "He's one of the most educated teachers, but also had real-world experience." Others just find Locke fascinating. "Pretty much the most interesting person u will ever come across … and sometimes he teaches history," one former student wrote on the website Rate My Teacher. Students and their parents have described Locke as a former "fighter pilot." They said he told the class about struggles with addiction, homelessness, and post-traumatic stress disorder from the Gulf War. One story connected homelessness to his military enlistment. "He said he was found by an Air Force recruiter on a bench and it turned him around," Ritter said. Senior Jake Ober, 18, told the Inquirer and Daily News that Locke said his father was "beaten to a pulp" in the 1960s in York, Pa., for hiring a black bartender. Another senior, Tim Welsch, 18, recalled Locke saying he was inside the Deptford Mall in 1996 when a gunman killed two people during a robbery. Students knew how much Locke could bench-press, too. "He's in extremely good shape for his age," Ritter said. Locke, his family members, and both an attorney and a union representative did not return requests for comment for this story. Barbara Wilson, a spokeswoman for the Cherry Hill School District, said the district could not comment on Locke's situation because it was a personnel matter. The school district did announce Friday that it had taken a "comprehensive" review of security protocols and would be implementing several short- and long-term improvements. The announcement, signed by Superintendent Joseph N. Meloche, did not mention Locke. Locke did grow up in York, one of James and Jeane Locke's four children. His brother Tom is a twin. At West York High School, where he played basketball and ran track, Locke made honor roll often. His father, a World War II veteran, died in December 1975 at 49, just months before Locke graduated. James E. Locke's obituary said he was a sales manager. One student said Locke may have attended York University after high school, but a spokeswoman said no one by that name graduated from the school. An Air Force spokesman confirmed that Locke was stationed at Eglin Air Force Base in Okaloosa County, Fla., from October 1984 to April 1988. He was an optometry specialist in the Air Force and achieved the rank of senior airman. It was unclear Friday whether Locke had continued his service in reserve or guard duty, but Ritter said he told students he had flown 54 missions. Locke and his wife, Sandra, applied for a marriage license in 1998, according to the Orlando Sentinel. Students said Locke has two children and one shares her name with a Grateful Dead song. It's unclear how Locke wound up in New Jersey from Florida, but he graduated with honors from Rowan University in 1999 with a bachelor's degree in history. He has been teaching at Cherry Hill East since 2001 and his salary, as of October 2016, was $99,421. In 2002, the Inquirer sat in on Locke's AP history class and wrote about his students as they prepared questions for Elie Wiesel, the Holocaust survivor, author, and Nobel laureate, and Betty Williams, a Northern Ireland peacemaker, prior to a speaking event. Bob Canzanese, a former English teacher at East, said he couldn't recall a student ever saying anything negative about Locke, a guitar player like himself. "I have the highest praise for him," said Canzanese, 68. "He is a wonderful human being. He is a phenomenal teacher. He is incredibly competent, well-read, and dedicated." During his Feb. 22 class, students said, Locke was discussing the debate over teachers carrying guns in schools and two students said he wrote "I have the gun" on a board. Ritter said Locke wrote that in jest, to suggest that he would be the one carrying a gun if the school ever allowed it. "He never had any intention of bringing a gun in school," Ritter said. Still, one student became visibly upset by that morning's class and Locke was called to principal Dennis Perry's office later that day, where he said his bag was searched. He was placed on administrative leave and ordered to undergo a physical and psychiatric evaluation. Another student in the class that morning called Locke's comments "inappropriate." "He said he was not in favor of arming teachers but he would be one of the teachers with the guns," said the student, who spoke to the Inquirer and Daily News on the condition of anonymity out of fear of retaliation from other students for "unpopular opinions" about Locke. "Everyone kind of looked at each other and were taken aback." That student said Mr. Locke is "not a bad guy" but felt his class is not on an "advanced placement" level because he spends most of his time telling stories. "I've taken AP courses before and in this course, I feel unprepared," the student said. "It's definitely one of the laxer AP classes. I know a lot of the students take it because they heard it's an easy A." Locke, on Monday morning, said his words in class that day were "misconstrued." "I never wanted any of this," he said. "I just wanted them to do something, anything, about the school." When asked if he'd seen news footage of students protesting for him Monday morning, Locke grew emotional. "What do you say to that?" he said. "You don't know if you made a difference or if they were ever listening, but apparently they were." Cherry Hill High School East senior Sammy Miller addresses the Cherry Hill School Board during a meeting on February 27, 2018 after two days of protests by hundreds of East students sparked by the suspension of popular history teacher Tim Locke, who made comments against security issues at the school following the Parkland, Florida school shooting. He praised Locke, saying he wrote a reference for his college applications. Staff writers Kevin Riordan and Tricia Nadolny contributed to this report.